Here is another SaHeeH hadeeth on the great reward that you will gain for shedding tears for the killing of Imaam Al-Hussayn (عليه السلام). There is another SaHeeH hadeeth about this same issue that has been posted earlier in this blog, posted here. all made up narrations in the name of Ahlul-Bait. TheShaheed is Al Hassan Bin ZaynulDeen al Jab’ee al Amili “الحسن بن زين الدين الجبعي العاملي ” (Died 965 hijri). “In Many of the Isnads there is error and Confusion between names of Men and thier fathers or thier nicknames and titles”. Source: “تنقيح المقال في علم الرجال ” Tankeeh el Maqal fi Ilm al Rijjal 1/177. 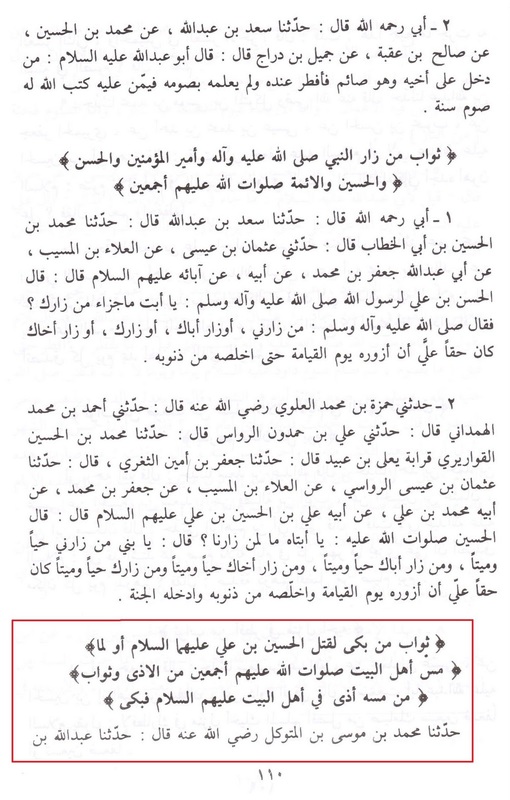 “There is no doubt that most of the Fiqh does not come from a Sahih Hadith, and those who are narrated by sahih are not free from big errors in Isnad and Matn and Dilalah”. Source: Fawa’ed Ha’ariyah “الفوائد الحائرية ” P 488.
and Wise Trustworthy scholars all narrate from the weak and the liars and the Unknown personalities and they know of this yet they still narrate from them. 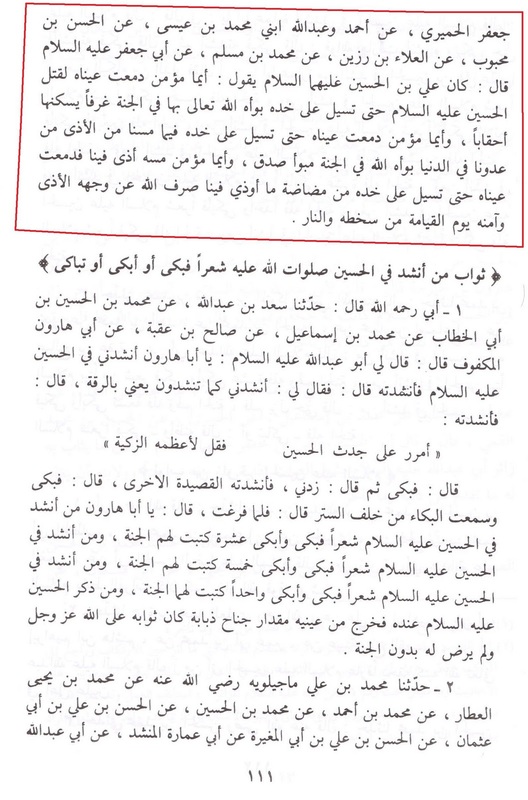 “And they are the Hadiths coming from the ma’asooms(infallible) PBUT to cure the cases of contradiction and conflict between our Hadiths and The Funny thing is that these Infallible Narrations started contradicting themselves”. عدة من أصحابنا، عن أحمد بن محمد، عن محمد بن الحسن بن أبي خالد شينولة قال: قلت لابي جعفر الثاني (عليه السلام): جعلت فداك إن مشايخنا رووا عن أبي جعفر وأبي عبدالله (عليهما السلام) وكانت التقية شديدة فكتموا كتبهم ولم تروعنهم فلما ماتوا صارت الكتب إلينا فقال: حدثوا بها فإنها حق. A number of our people have narrated from Ahmad ibn Muhammad from Muhammad ibn al-Hassan ibn abu Khalid Shaynula who has said the following. 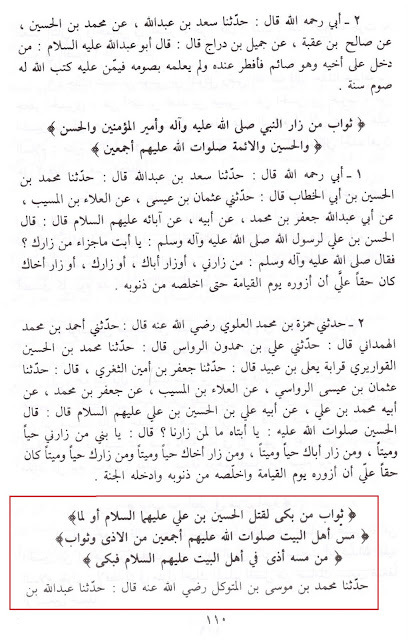 ”I said to Abu Ja‘far (alaihi salam) second, ‘May Allah take my soul in your service, our shaikhs have narrated Hadith from Imam abu Ja‘far and from Imam abu ‘Abdallah (alaihuma salam) and at that time taqiya was severe, so they concealed their books and did not narrate from them. When they died their books came to us.’” The Imam said, “You may narrate from them because they contain the truth”. First and foremost, that hadeeth that you just posted above is da'eef because of محمد بن الحسن بن أبي خالد who is majhool according to Majlisee and Khu'ee.